So, I’ve already made these pumpkin chocolate chip muffins, like, a million times. I’ve been testing them out before I shared with you guys. Ok, not a million times but a lot. And at some point I didn’t have to ‘test’ anymore, but I think I just wanted to keep eatin’ ’em. The struggle is real, you guys. Can you blame me? These muffins have lots of iconic fall players, like cinnamon, nutmeg and pumpkin puree and they’re topped with pumpkin seeds for a little texture. Bonus—>they make your home smell amazing! It’s literally what the name says – ‘pure pumpkin.’ Pumpkin is roasted and then blitzed up until nice and smooth. Don’t think ‘OMG, Dawn, now I gotta make my own pumpkin puree? !’ No, no. The stuff is readily available in your grocery store where you would typically find baked goods. The puree is what’s used in these pumpkin chocolate chip muffins. Don’t be tempted to use ‘pumpkin pie filling’. It’s not the same thing…at all. That stuff is sweetened and has added spices. If you are so inclined to make your own pumpkin puree my friend, Amy, of House of Nash Eats has a how-to guide on how to make it. This recipe yields a lot of batter. Use it all! Fill up the muffin liners completely; each muffin has a full standard ice-cream scoop plus a little bit. Dark chocolate chips are used in this recipe, but feel free to use milk, semi-sweet or even white chocolate chips. I also tested with chocolate chunks; while they gave the same taste, I preferred the look of chips. Bake until a wooden skewer comes out free from wet batter. These take about 18-20 minutes; check on at 18 minutes since ovens vary. Like pretty much all baked goods, these are best enjoyed the day they are made, but can last up to 3 days. Also, they freeze well. 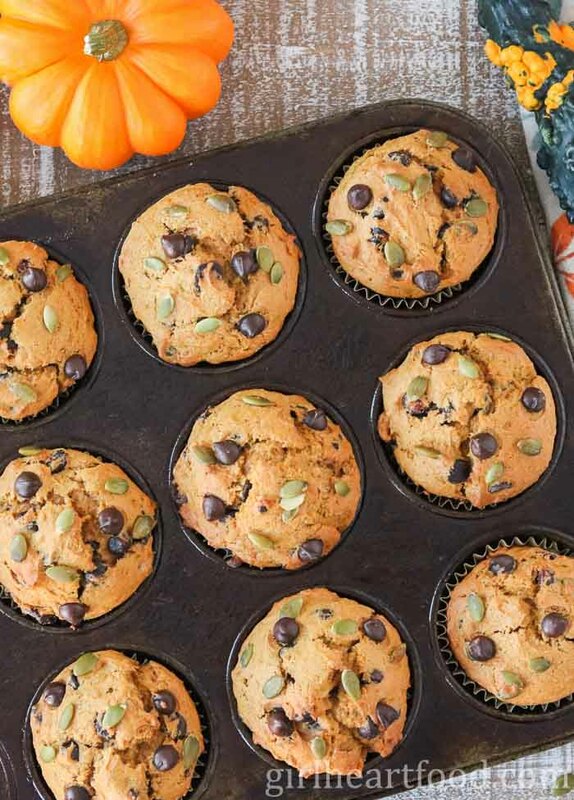 Hope you love these pumpkin chocolate chips muffins too! These Pumpkin Chocolate Chip Muffins are jam packed with warming fall spices like cinnamon, nutmeg, clove and ginger. Plus, there's dried cranberries and pumpkin seeds for added oomph and texture. 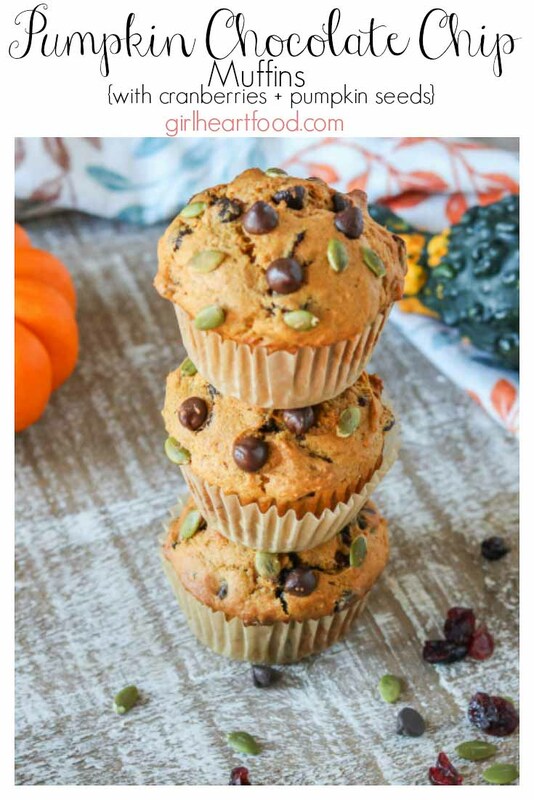 Fall and these muffins are definitely a match made in foodie heaven! Mix all dry ingredients down to clove in a bowl and lay to one side. Preheat oven to 400 F.
In a stand mixer (or using a hand mixer) blend butter and sugar until combined and fluffy, about 2 minutes. Add vanilla extract and eggs, one at a time, until combined. Add pumpkin puree and almond milk and blend about 30 seconds. Add reserved flour mixture to stand mixer mixture and blend until just combined, about 1-2 minutes. Add chocolate chunks and cranberries and blend until incorporated. Line muffin tin with muffin liners and spray with baking spray. Scoop muffin mixture into liners. Top with pumpkin seeds and extra chocolate chips. Bake about 18-20 minutes or until wooden skewer comes out clean when inserted into muffins. Let cool on rack about 10-20 minutes. Enjoy! YUM! These lovely muffins have it all! I love how you have so much fall flavor packed into these! And the sweet-tangy combo with the chocolate and cranberries – so much yum! Using the pumpkin seeds with the pumpkin is brilliant! I’m loving your recipes with all the fall flavors and I bet this one will not disappoint either! Can’t wait to give it a try! Dawn, you’re 100% guilty! I mean, you’ve made and tasted these delicious muffins many times, and you’ve never shipped me a single muffin. That’s cruel, you know. On the other hand, these muffins look and sound so delicious that I’m willing to forgive you. Hehehehe 😀 Happy to hear that Ben 😉 Thanks so much! When food looks and sounds so good like this, you can’t help imagining how it tastes. These are all wonder fall flavors in a simple muffin — I love it. Especially the cranberry to round it out. Count me in, Dawn! Dawn – as you know, pumpkin + chocolate is the match made in heaven you never knew about when you were a kid – well, I didn’t anyway! I can’t get enough! And this recipe looks like total heaven! Thanks! 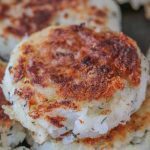 These are loaded with all the fallish ingredients I love Dawn! I’d have a hard time enjoying just one! Pinned! Love pumpkin baked goods topped with pumpkin seeds. Because I love pumpkin seeds more than any other seeds…These muffins won’t make it longer than a morning at my house. Not even past 10 o’clock in the morning. Fresh new batch for afternoon coffee:) Pinned! I’m loving all the pumpkin recipes this time of year! There is just something so cozy and comforting about pumpkin baked goods! I’ve been working on a pumpkin muffin recipe with dark chocolate chips too (because that combo with all the warming spices is just the best!) But I never thought to add cranberries and pumpkin seeds! Great idea Dawn. And love that these are big muffins. The best part about a muffin is the muffin top! Happy Monday! Me too! It is a really great combo, for sure! And I agree with ya about the muffin top 😉 Thanks Leanne and happy Monday to ya too! Ha – one of my current ponderings is why oh why is there a screen between me and these glorious muffins!? I simply LOVE the combo of pumpkin and chocolate and these would make my monday marvelous! Hope you had a wonderful weekend, Dawn! Hahaha – right 😉 ?? Thanks so much, Shashi! You too! YES to pumpkin muffins! Especially with chocolate chips and dried cranberries. These look SO GOOD! My favorite thing about muffins is that they’re basically cake you can spread butter on (and eat for breakfast) so they’re a regular treat around here :). I’ll have to try these! Have a great week, Dawn!